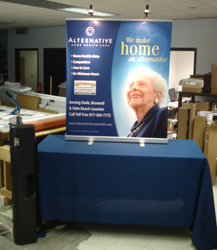 Table Banners are popular advertising items. However, the name Table Banner encompasses many trade show display items, therefore may be misunderstood. It stands to reason that any banner put on your table, could be called a "Table Banner." And a Table Banner is good advertising when skillfully done. A Table Banner is good for your advertising dollar because it utilizes your advertising space. When choosing your Table Banner, it's important to know your target audience. If your target market is more of the "upscale" crowd, a vinyl Table Banner may signify you don't fit in with your audience. However, if you are handing out food samples in a grocery store, a vinyl Table Banner may be appropriate. Call or email me today. We'll get the Table Banner that's right for you! Table Banner also know as a Table Runner. Table Banner also known as a Retractable Banner Stand.